After letting the valet brave the elements, we stepped inside to what seemed like a time warp. Despite having been the better half of a decade, not much seems to have changed inside Antica Posta. It’s still a charming old house that was reborn as an Italian restaurant. Once we were seated I was happy to see that the menu looked just as appealing and the staff just as welcoming. I think I even got the same seat as the last time I was there. Once we were seated and our drink orders were taken, we settled down to tackle the real problem: what to order. While every meal has this challenge, Antica Posta makes is a little more difficult by having multiple antipasti sections. First is Chefs Alessandro & Ciccio Signature Antipasti-Appetizers, then a section of Antipasti, and finally a section of Antipasti Small Bites Serving. Now I understand how these could be three distinct sections, but some of them feature the same dishes. For example, Polpette Toscane is featured in both the Antipasti section and the Antipasti Small Bites Serving and both have the same description of “Classic Tuscan meat balls served with tomato sauce”. 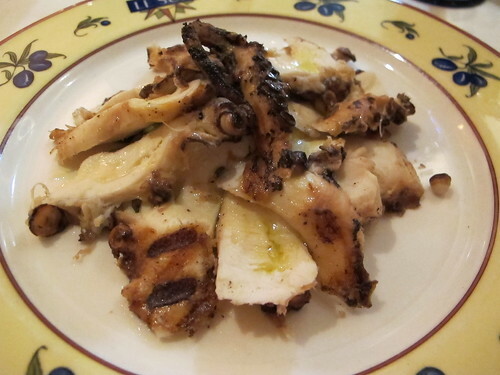 Looking past the menu’s confusing arrangement, I was lured by one of that day’s specials, the Grilled Octopus. 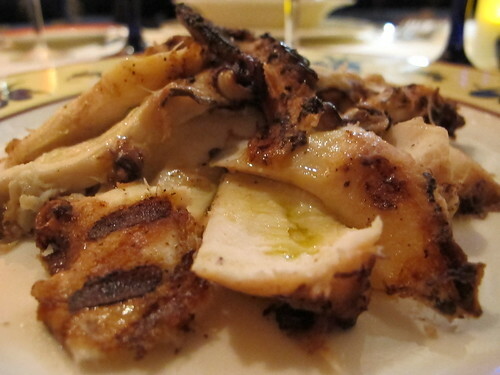 With a beautiful set of grill marks, this octopus was expertly prepared. Each bite had a meaty juiciness that texturally reminded me of very well cooked, tender chicken. I was actually expecting more of a crispy char to this cephalopod, but the subtle smokiness and tenderness quickly won me over. As if the three sections of appetizers wasn’t confusing enough, most of the secondi piatti can be had enjoyed in either appetizer or main course sizes. This is a feature I wish more restaurants would adopt. Sometimes deciding on just one dish always leaves me wondering just how good were the other choices. With this option, you have two small dishes instead of one entrée. Jennifer was also a proponent of this concept as she ordered a small dish of one of the house specialties, Gemelli alla Fiorentina. 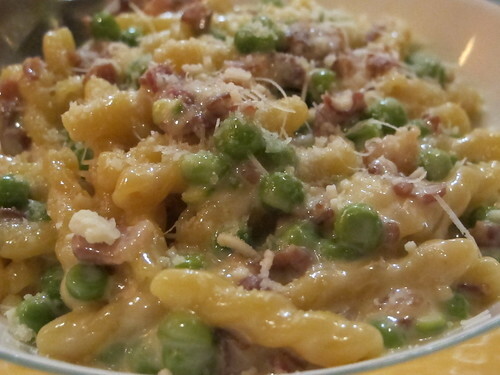 Really nothing more than gemelli pasta with prosciutto, green peas, and cream, it was everything you could want in a cream based pasta dish. 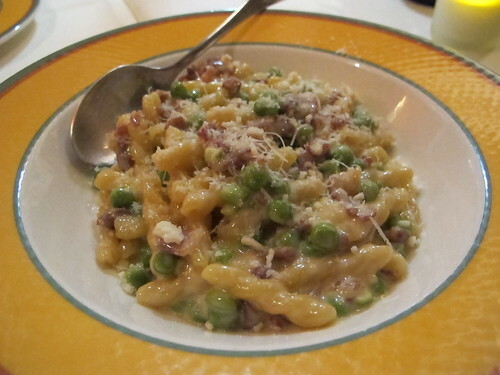 Everything was in sync, the salinity and meatiness of the prosciutto, the fresh bite of the green peas, the perfectly cooked pasta; it’s a dish like this that makes me have faith in a waitress’ recommendation. When it came to my entrée, I was looking for something substantial, more than your standard pasta dish. I thought a veal chop would fit that bill perfectly. 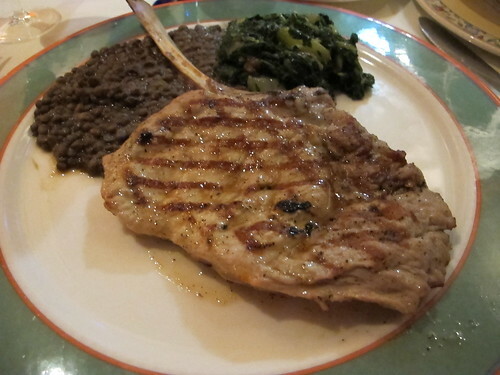 Lombatina di Vitella alla griglia con verdure di stagnone may be the actual name, but to us non polyglots, that’s a grilled veal chop with seasonal vegetables. 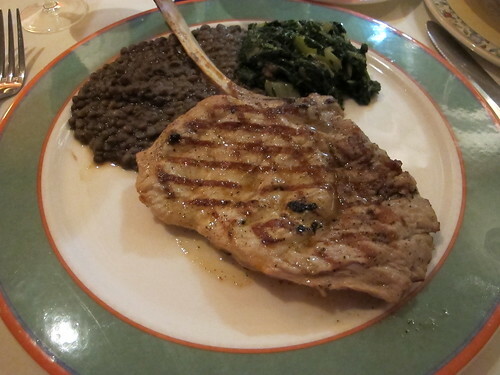 This was a large veal chop that appeared to be pounded thin, seasoned simply with salt and pepper and then grilled. 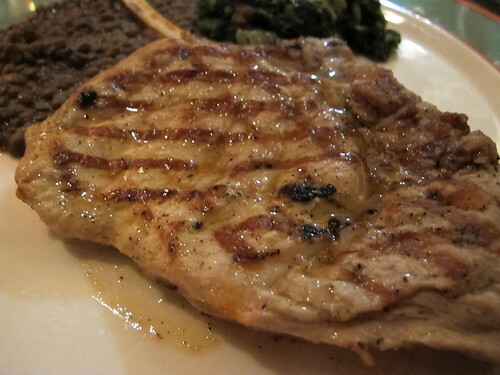 Amazingly, this veal chop had a duality rarely seen. It was both juicy and at the same time overcooked and dry. I want to say the dryness was isolated to the outer fringe, but I remember it being the exact opposite. No idea how that would work, but there you go. For my sides I had sautéed greens, plain and quite dully flavored, and lentils. The lentils were the far superior side as each bite was tender and full of a pleasantly beefy flavor. For reason or another, we agreed to a dessert. I’m chalking it up to my resolve being weakened by the Gemelli. 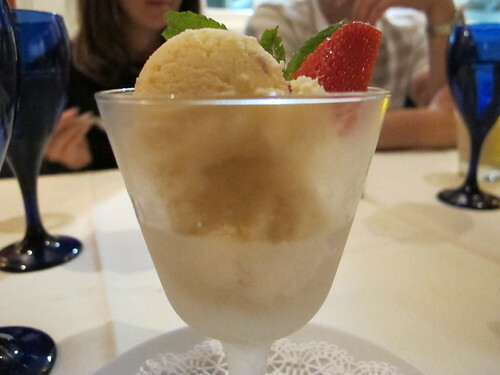 There was a litany of tidy selection of excellent dessert choices including some fine Parmgiano and Pecorino cheese, but I was sold on the idea of homemade gelato. 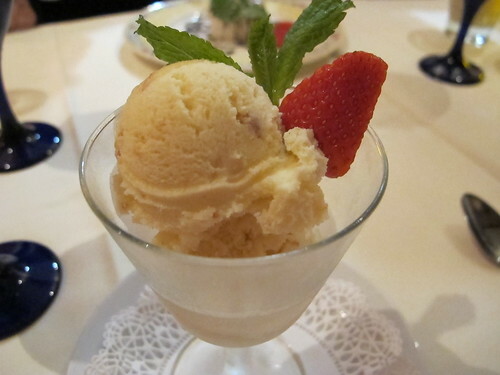 It may be a little unimaginative but I like the idea of almond gelato. Honestly, it was an excellent gelato and fine end to the meal. As much as I enjoy Italian food, I rarely seek it out; at least that’s how I’m explaining the prolonged time between visits to Antica Posta. Outside of a dry veal chop, this was an excellent dinner and a reminder of just how delicious well cooked pasta, cured pork, and cream can be. Sure Antica Posta has its faults, especially that confusing menu, but each time I’ve patronized the small house on E. Paces Ferry, I’ve come away full and satisfied. Maybe next time, I’ll have better luck with the veal, but at least I can rely on their pastas to always satisfy.